Wedding stress? Pimple on wedding day? Fear not dear brides-to-be, as always we can save your day! Wedding planning can be a stressful time in life and as exciting as it may be, it may lead to some stress breakouts which can amp up your stress levels. 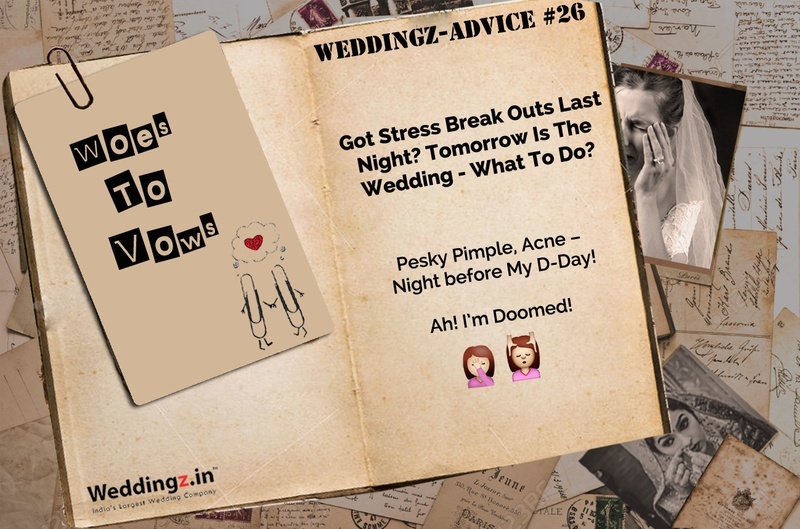 However, all you need to do is take a deep breath and read this article on how to not let that pimple spoil your most special day! As always, we will be your guide to a rocking wedding day! Small pimples which threaten to ruin your big day can often be controlled with a simple hot or ice compress. While hot compress pops the pimples (the throbbing ones), the cold compress can reduce the redness and size of the pimple (new one) considerably! For this, we would advise you to check with your dermatologist and determine whether you can go ahead with it. Depending on your skin type, the doctor can give you the best dose and voila! Your pesky pimple is gone for good! If you have a couple of days in hand, try a few home remedies like lemon juice, tea tree oil, cucumber juice or whatever usually works for you. Simply dab on either one of these and wash off after 20 minutes. However, refrain from using new products since it may aggravate your condition! Follow up these treatments with a cold compress or some astringent and you will be all set to dazzle everyone on you special day! Trust us, your beautician can do more than conceal your zit on the wedding day! Simply tell them in advance whether you are prone to acne or not and they will now just the right product to use. Experts suggest using a concealer that is closest to your natural shade and dabbing some setting powder on it. After all, it is your special day! Pimple or no pimple, your mister will think you are the most gorgeous woman on the earth! You have planned your perfect day for so long; you might as well enjoy every bit of it. Take a few shots, put on your dancing shoes and make the day more memorable! Check out these beauty secrets for that gorgeous bridal glow. Follow these skin care tips for a flawless skin. Try these detox water recipes for a beautiful bridal glow.